Ultrahaptics is the world’s leading mid-air haptics company. The company has developed a unique technology that enables users to receive tactile feedback in mid-air without the need for gloves or controllers. The technology uses ultrasound to project sensations through the air directly onto the user’s hands, enabling users to ‘feel’ virtual buttons, get tactile feedback for mid-air gestures, or interact with virtual objects. DOVU is a token you earn and spend by sharing and changing the way you travel. People contribute to the future of their cities through actions. Smart cities need smart citizens. Right now, data is given away by consumers every day for free through apps or social media without us even noticing. Whether you’re working on connected cars, public transport, or autonomous vehicles, the DOV token facilitates a new transfer of value. Earn tokens by sharing car data, or driving green. Use your tokens for ecosystem services such as parking, EV charging, and much more. Blu Wireless Technology is a firm that is leading the way in bringing ultra-fast mmWave wireless technology into homes and businesses through the roll-out of WiGig and 5G networks. Blu Wireless technology already plays an important role in the creation and roll-out of the next generation of high-speed internet and wireless-enabled systems, ranging from virtual reality headsets and ultra-fast video streaming, through to 5G networks. They are also set to help pave the way for the advent of so-called ‘smart’ cities, in which the real-time collection and analysis of data from urban assets and infrastructure is undertaken to better and more efficiently manage those resources. The Unmanned Flight Laboratory is a group of staff, students, and recent UWE graduates developing a range of enabling technologies and practical applications for Unmanned Aerial Vehicles (UAVs), under the leadership of Dr Steve Wright (Associate Professor, Aerospace Engineering). The UFL is part of the University of the West of England’s Engineering Design and Mathematics department, and is based in “The Foundry”, the specialist development laboratory recently opened at UWE, and shared with other industry-serving organisations within UWE’s “Enterprise Studio Network”. The UFL generally operates in the Technology Readiness Level range 4-6, delivering equipment for novel technology investigation and demonstration. Projects include development of generic UAV capability technologies (e.g. position sensing, on-board processing, airframe design, propulsion optimisation) in order to provide particular applications for its industrial partners (e.g. MBDA, Leonardo Helicopter Division). 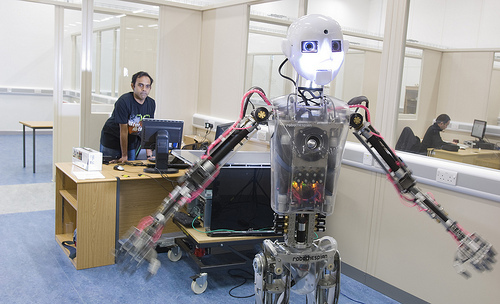 The Robotic Engineering and Computing for Healthcare Centre at Bristol Robotics Laboratory was established in 2016 to address a wide range of healthcare needs. We develop novel, safe and interactive robotic systems in close collaborations with clinical and non-clinical users. Our basic research work, which includes Multimodal Human-Robot Interaction, Sensing and Control, Machine Learning and Cognitive Architectures, is complemented by a technology translation focus through effective validation studies and commercial presence. Our interest stretches from surgical robotics to assisted living technologies for physical and cognitive support of older adults. We maintain strong national and international links with both industry and other robotics research institutes. Through the Bristol Robotics Laboratory we are involved in other innovative applications of robotics for commercial and industrial exploitation and share the thriving University Enterprise Zone innovation community space on Frenchay Campus. Virtual Viewing is an award winning, UK based, advanced computer graphics and data visualisation company which specialises in creating apps, 3D, 4D and 5D animations which deliver innovative visualisation and sophisticated marketing/communication solutions, for use predominantly in the construction and property sectors. Virtual Viewing is a UK market leader in fusing leading-edge graphical software with SMART building data/techniques/learning and its internally developed SlimBIM™ methodology to produce award-winning interactive applications and support solutions – making highly complex data extremely simple to access in a visually stunning manner.